It’s time to start saving. Let me introduce myself: Connecticut born & raised, ordinary day job, love the beach, teach dance, obsessed with scrapbooking, and shopping is my exercise, literally. Oh, and I have the cutest mini-lop ever. Let me backtrack the with introduction a little bit. As I grew up, everything I needed was always provided for me, and then some: a great house with a playroom and a huge backyard, yearly vacations, dance classes from when I turned two until I graduated high school, and a closet full of matching outfits from Gap Kids and Limited Too (keep in mind it was the 90’s…). My winter coats, hats and gloves even matched my clothes perfectly. I was used to having nice things, and I still am. That makes me sound spoiled. I wasn’t spoiled. I also had my fair share of hand-me-downs. I never got an “allowance”, and I certainly did not spend my summers uselessly sitting around. Don’t get me wrong, I’m not complaining, I’m actually extremely thankful. When I turned twelve, I spent my summers volunteering everyday which led to being hired at the age of fifteen. I had two jobs simultaneously the year I turned fifteen and have not been unemployed since then, so I understand the meaning of hard work, earning what you own and living within your own means. Every single paycheck went strait into the bank. There wasn’t even a cell phone bill to pay because 15 year olds didn’t have cell phones back then! It’s scary to think that was only 10 years ago! “Save, save, save” was drilled into my head every single day. I opened an IRA and had a credit card building credit before I entered college at 17, and I might actually have a chance of retiring before I turn 65 (which I am convinced will be impossible for anyone in my generation, at least in Connecticut). Clearly I’m not breaking the bank on my Tory Burch Flats, Ann Taylor suit, Burberry purse, polarized RayBan wayfarers and Michael Kors watch as everyone around me seems to think (wait, do they think I actually pay full price for any of this? Yikes)! If that was the case, I wouldn’t have been able to become a homeowner on my own before my 23rd birthday… and buy a brand new car in full with cash that same year… and never, ever not pay a bill in full well in advance of it’s due date. So, after all of that background, here’s the paragraph actually related to my blog! About two months ago, I went to the mall and wanted a jumpsuit, mainly because they’re in style. I mean, the idea of grabbing something that’s “one piece” is much more desirable at 6:30am when I’m getting dressed for work, than trying to make my skirt, shirt and sweater all match. So, I go to Lord & Taylor, which is always my first stop at Westfarms. 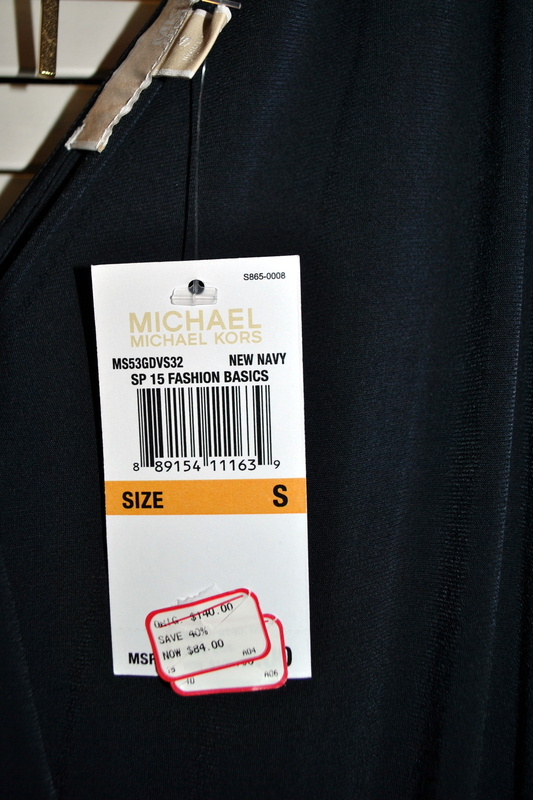 Navy Michael Kors Jumpsuit? Fits well, looks cute, super comfortable. Price tag? $140… a little steep. But I’m not worried because it’s marked down to $84, with an additional 50% off markdowns… plus I had a coupon for $20 off of a $40 purchase. That brought me to $24. But wait, can’t forget that 20% coupon I received in an e-mail that the cashier could scan directly from my phone. Final price after tax: $20.41. SCORE! Not bad for leaving with exactly what I came looking for, right? But no surprise to me, because honestly, this is just how I shop. Always. This shopping trip, among many, got me thinking: I get awesome clothes for fractions of what they cost, all the time! I’m not talking outlet shopping (yes outlets are fun on a nice sunny day, but it’s also proven they sell lower quality merchandise). I’m not even talking shopping at Marshalls or TJ Maxx, which I’m starting to think are over-priced. And I am certainly not talking “fake” or “Knock off” anything. I’m talking real designer clothes at high fashion and mid-level department stores for less than what you’d pay for a similar item at a price-sensitive department store or discount department store. Actually, I’ll take it one step further and show you real examples of how to spend less on a brand new item at a high-end department store than you would for the same item used at a consignment shop! Basically, in future posts I’ll keep you up to date with awesome sales, great coupons, information on rewards cards (the Bloomingdales one is AMAZING), ways to get instant cash back, and ways to get great style at a great price. Don’t worry, every once in a while I’ll hit on non-fashion items too: groceries, drug store items, even travel deals.